What is a Schockley Diode? In simple terms, a Shockley diode is a four layered semiconductor diode. In electronic terms, it is a â€œP-N-P-Nâ€ diode and is equivalent to a thyristor with a disconnected gate. Though this basic diode does not find much application in electronic circuits nowadays, the concept is largely employed and is one of the remarkable inventions in the history of electronics. The interesting history of the Shockley diode cannot be interpreted without mentioning a few important life events of its inventor, the popular physicist and the co-inventor of the transistor, William Bradford Shockley. 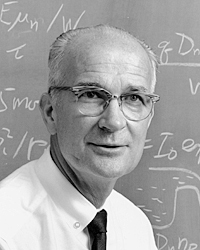 William Shockley was an American engineer and professor who was brought up in Palo Alto, California. He did his under graduation in Caltech and completed his PhD in MIT. After graduating in 1936, he chose to start working at Bell Labs. For about two decades, he worked on electronic devices and more on semiconductor materials. His research paved way for the creation of the first transistor in 1947 along with Walter Brattain and John Bardeen. After the invention of the transistor, Shockley noticed that Bellâ€™s management was promoting Bardeen and Brattainâ€™s names ahead of his on the patent of the transistor. But, some of his colleagues were of the opinion that these issues were the result of the abrasive management style of Shockley. Such unfavorable events in the early 1950s made Shockley really upset with the management of Bell Labs. These issues were at its worst in 1953, causing a cut throat situation for Shockley and he made the most remarkable and stern decision of his lifetime to quit Bell Labs and he returned to Caltech as a visiting professor. At Caltech, Shockley became friends with Arnold Orville Beckman, the inventor of the pH meter. It was then that Shockley learned more about the inherent capabilities of silicon and was convinced that silicon would certainly and ultimately replace germanium as the primary material used for transistor construction. It was during that time, that is, in 1954 that Texas Instruments had started manufacturing silicon transistors. Shockley believed that he could do something more in this arena. Beckman backed Shockleyâ€™s efforts and belief under the umbrella of his Beckman Instruments. Shockley recruited the most creative and intelligent team of young scientists and engineers in the world for developing and manufacturing transistors, mainly single-crystal silicon boules. At that time, producing such silicon products was a difficult prospect because of the high melting point of silicon. While the research on the silicon transistors continued, all on a sudden, Shockley hit upon the brilliant idea of using a four-layer device (a transistor is a three-layer device) that would possess the unique and novel quality of locking into the â€œonâ€ and â€œoffâ€ state without any further control inputs!! Such circuits normally required about three transistors; therefore, he thought that the new diodes can greatly reduce complexity for large switching networks. This four-layer diode was later named as the Shockley diode. Shockley was convinced that the new device was just as significant as the transistor and he maintained the entire project as a top secret, drawing an â€˜iron curtainâ€™ even within the company. This led to his paranoid behaviour increasing day after day. He was also becoming indecisive most of the times; sometimes he thought that starting immediate production of the basic transistors was important; sometimes he stressed on the Shockley diode project. This really upset most of his employees and frequent rebellions became common within the company. Ultimately, a group of eight youngest employees complained to Beckman demanding replacement of Shockley in the management role. Later, these eight left Shockleyâ€™s Semiconductor Laboratory to form a different company and gradually each one started founding new companies. Thus, Shockley’s attempts to commercialize the new four layer diode led to California’s “Silicon Valley” which is now the hotbed of electronics innovation. Unfortunately for Shockley, he was never able to make the four-layer diode a commercial hit despite working out the technical details and entering production in the 1960s. The invention of the integrated circuits allowed multiple transistors required to produce a switch to be placed on a single chip. This invention, eventually, nullified the parts-count advantage of Shockleyâ€™s four layer diode design. On the other hand, the four layer diode was, in essence, the first integrated circuit because it performed the work of two transistors, two resistors and a diode, all in a single crystal. Unluckily, making these devices was a tricky task; so, Shockley could never manage to build truly commercially viable ones. The four-layer diode was the key to Shockleyâ€™s plan of revolutionizing the phone system of AT&T. It was indeed a great device in theory, but not in practice. The Shockley diode is a crystal made of alternating layers of N-type and P-type semiconductors. Having four layers, the Shockley diode perhaps could do more than a transistor. Besides, it could act like a rectifier, turning alternating current to direct current. Moreover, when break-over voltage was applied, it could switch on and off. Thus, these diodes could be used to replace rectifiers and transistors required to connect long distance phone calls. Four-layered semiconductors are used today in the form of thyristors and thus, Shockley diodes do exist. What could explain the revolutionary idea behind the Shockley diode better than these words of Harry Sello?